Programmable thermostats do not save energy. False. Programmable thermostats enable you to change the temperature when a building is unoccupied. In the winter, turning down the thermostat during unoccupied or inactive periods will result in less energy consumption. The same goes for turning up the temperature during the summer. Many people think otherwise. 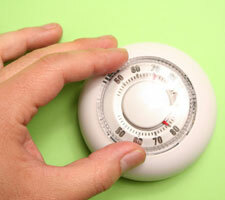 Heating a cold building uses less energy than maintaining a warm temperature. A rule of thumb is a 1% reduction in your heating/cooling bill for each degree you turn down/up a thermostat for eight hours. If your building has a simple HVAC system and is unoccupied nights and weekends, turning the thermostat down 8°F will reduce heating costs by about 16%. This does not apply to complex systems which involve simultaneous use of heating and cooling.